"If you find a piece of the falling star and grind it into dust, it has magical powers." It is said that the “light of winter is the poetry of patience.” Nature hibernates during the long nights and bitterly cold days of the season. For the spirited coyote in this charming tale, winter is a time of loneliness and longing. His yearning for fun, warmth, and belonging leads him on an adventure that leaves him forever changed. The coyote is miserable because during the winter his friends hibernate. It’s lonely, dark, and cold. He tries to join the Navajo in their Christmas and traditional celebrations but is constantly rebuked by both animal and humans alike. Human traditions are not meant for animals, they say. The coyote, frustrated with the unfairness of it all, misuses a great magic; and it ultimately backfires, scarring him for life. It takes the lesson of fire and the help of a shepherdess friend in order for him to accept himself as a coyote. Melenchek’s children’s story is one that can be enjoyed for the sake of itself, or it can be viewed as a tale of one finding out how to belong in a world that makes it difficult to do so. The author blends this insight in vivid, fun, and colorful illustrations placed in a setting that may not be as well-known to some—the life and culture of Native Americans of the Southwest. 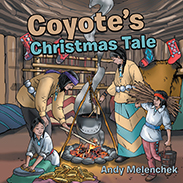 The whimsical yet bittersweet tale of the coyote is one that will appeal to children and adults who are looking for a Christmas story that stands out from the rest.